EASTHAMPTON — In the afternoons, parents line their cars in front of Maple Elementary School to pick up their children. To find out how much pollution idling cars are spewing into the atmosphere, you don’t have to ask a scientist. You can ask a fourth-grader. 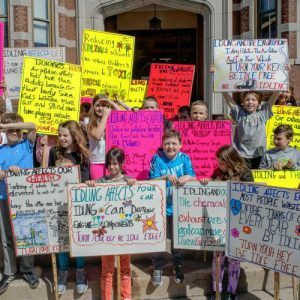 Over the course of two days, students at the elementary school conducted a study to determine how much pollution idling cars were emitting while parked in front of the building. Students discovered that there were nearly 3.78 gallons of pollution produced in that time, and an “anti-idling” campaign is now underway. A state law limits unnecessary engine idling to five minutes. “People idle without thinking about it and I was shocked with the overall amount of time people were idling,” said Judy Averill, the school’s principal. A parent approached Averill in early February concerned with the number of cars idling outside the school and how long cars were left idling. Students made posters to put up outside the school to discourage idling cars and even created an anti-idling pledge for parents, teachers, and staff to sign. At an all-school assembly on Wednesday, students will post the signs and the pledges will be tallied. Letters were sent to bus drivers, delivery truck drivers, teachers and staff asking drivers to eliminate idling anytime they are waiting for more than 10 minutes.